Book Drunk: Reviewed: The Island Escape by Kerry Fisher. 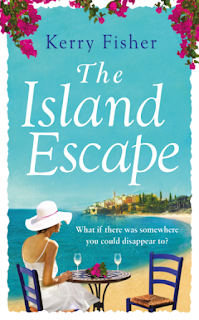 The Island Escape was published by Avon on May 21, 2015. Thanks to Sabah at Light Brigade PR for sending me a copy of this book to review for the blog tour. Kerry Fisher’s debut novel The School Gate Survival Guide was one of my favourite books last year so I couldn’t wait for her next book. For me, The Island Escape completely surpassed Kerry’s first book, I loved it even more than I imagined I would. I seriously could not put it down for one second – so immersed in the lives of Octavia and Roberta and their families. There’s such a beautiful tone to this story as we see two long-time friends, now in their late thirties, looking at where their lives are now and thinking about the future – is it ever going to be how they imagined? The Island Escape will for sure be one of my favourite books of 2015, it was such a wonderful read that I didn’t ever want to see end. 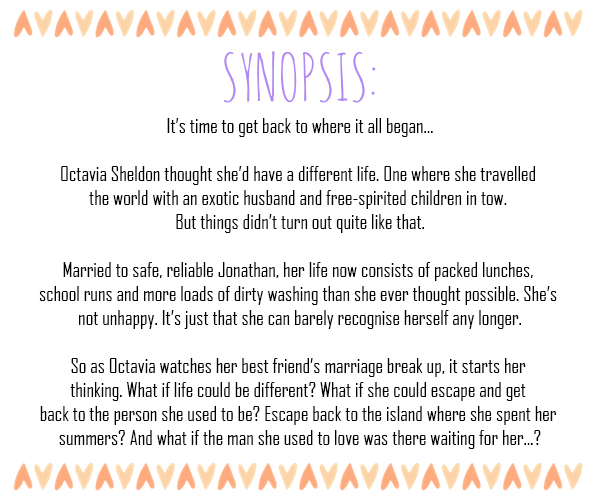 The Island Escape is told in alternating chapters between Roberta and Octavia. Both women are very different, and not afraid to admit it either, but they know each other extremely well. What I liked the most about their friendship was how honest it was. At times they didn’t understand each other and their choices, at times they were envious of each other and sometimes they did despair of each other but they cared. They always cared. There was such an incredible bond between them which was very heartening and admirable. Roberta is married to Scott with one daughter in Alicia. The book starts with Roberta at the police station with Scott threatening to press charges so you can tell how well their marriage is going. Things quickly fall apart for the two of them and even though Roberta can’t imagine her life without Scott, she tries to manage, with the support of best friend Octavia. Octavia is quietly glad to see the back of her friend’s husband, though she’s not sure how long it will last. But keeping her newly single best friend company sees her look at her own life differently, especially when she’s barely recognised at a school reunion. Yes she’s married with three kids of her own and she’s content with that but what happened to the happy, care-free person she used to be? And whatever happened to the guy that she used to love many years ago? There’s just something very real about Kerry’s two leading characters, Octavia and Roberta. I really genuinely took an interest in them and how their lives were turning out and through their decisions, the good and the bad ones, I found huge respect for them with their dedication to giving their children the best possible lives but still with that acknowledgment that real life isn’t perfect. People will make mistakes, they’ll hurt other people, they’ll change their minds and at times say things they might regret later but that’s what life is about. Kerry writes with such honesty and authenticity and The Island Escape is a book about ‘proper’ people, the kind you’d expect to actually meet in real life and not the kind that are so overly fictional with their incredible breaks and perfect happy endings. Flawed characters are much easier for me to connect with and Octavia and Roberta are two of my absolute favourites. I was so invested in their lives and Kerry really built so much depth to this novel with so much covered – themes I don’t want to mention to avoid spoilers but everything was developed brilliantly, each layer to this book was interesting and brought up some of the harsh realities of life but with such good humour at times too. Though a lot of this book is about the serious side to life, marriage break-ups, parenthood, careers and old friendships, there are plenty of lighter moments and a wonderful cast of supporting characters. I loved the genuine feel to the children in this story and they brought many smiles with their one-liners and just natural childlike comments and actions. They were developed just as strongly as Kerry built up her main characters and though this story is about Roberta and Octavia, I couldn’t say any character suffered from a lack of depth or substance. I loved the characters – loved to hate some of them – in fact I just loved the whole book from start to finish. The opening line drew me in, made me laugh and I was set up to adore everything about this book. The island, from the title, doesn’t play the biggest part but there is such a summery feel to the story, even down to uplifting feel that life is for living, not regretting. I would say The Island Escape is the perfect summer read, the perfect beach read… but don’t expect it to last more than one sitting. It may be 400 pages long but it is such a delight to read, you won’t want to put it down. Already up there with my favourite books of the year, The Island Escape is a glorious unputdownable summer read. Fabulous review - I loved it too! Thanks Joanne, it's such a stunning book! Glad you enjoyed it too. Thank you so much for taking part in my blog tour and for such a lovely review - I know you are very busy with your studies, so I really appreciate it, Sophie. Thank you.